Swiss timepieces have been long renowned for their quality and precision. 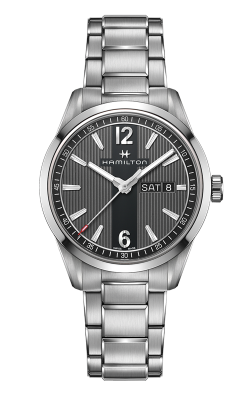 Hamilton men's watches seamlessly blend this Swiss exactitude with the American pioneer spirit. 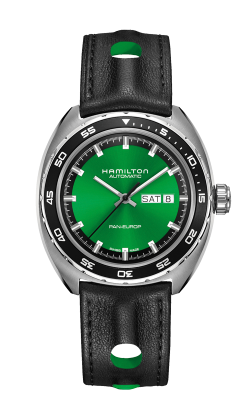 Currently based in the heart of watchmaking territory in Switzerland, Hamilton was established in Pennsylvania in 1892. The jeweler first gained recognition during the early days of American railroads by supplying accurate timepieces that helped synchronize trains and reduce accidents. 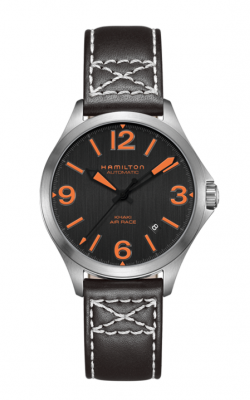 As train travel gave way to aviation during the early 20th century, Hamilton watches became the preferred timepieces of the new U.S. Airmail service. This historic designer has since grown into a functional accessory artisan with a penchant for style; Hamilton men's watches have been featured in over 450 feature films and are cherished by wayfaring gentlemen worldwide. 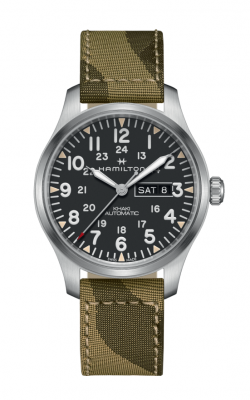 Hamilton's Khaki Aviation collection exemplifies the designer's pioneer history. Inspired by over a century of aviation partnerships, these sleek watches evoke modernity. Durable materials like stainless steel, quartz, and rubber highlight the designer's commitment to practicality, while innovative technical features blur the boundary between jewelry and machine. For example, the X-Wind models are the first watches to include a drift angle calculator that aids pilots in determining how crosswinds affect their flight. Some styles also include a second time zone feature to ease jet setters’ travel transitions. 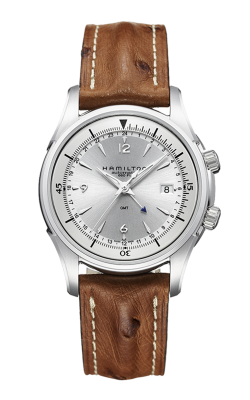 With such skillful blending of adventure and accuracy, Hamilton has established itself as the master of functional accessories. For those who prefer exploring the depths to soaring the skies, the Khaki Navy collection contains a variety of exquisite underwater watches. Hamilton offers models for a variety of water passions ranging from ocean diving to casual beach going. Deep-sea adventurers can benefit from the technical models' underwater luminescence and uni-directional rotating bezels, allowing them to explore up to 1,000 meters below the surface. On the other hand, more relaxed water enthusiasts appreciate the fashionable and water-resistant Auto models. The Pioneer Auto design boasts up to 80 hours of power reserve, perfect for extended travel. 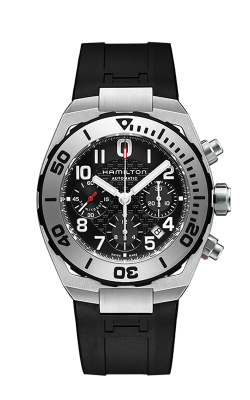 With such a wide offering, Hamilton men's watches make ideal accessories for any open-minded explorer. 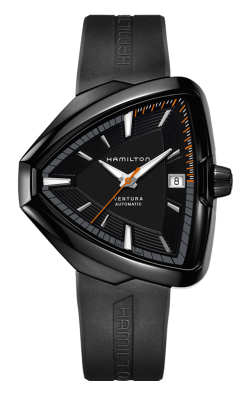 Why Shop for Hamilton Men's Watches at Safa Jewelers? Safa Jewelers is located in Menlo Park Mall in Edison, New Jersey and serves the Edison, Monmouth County, Middlesex County, and Staten Island areas. In addition to designer Swiss watches, Safa offers a range of fine fashion, bridal, and engagement jewelry. With 0% financing options available, customers don't have to wait to bring home their dream accessory. Furthermore, thanks to Safa Jewelers' lifetime diamond upgrade, couples can begin with a special diamond that evolves as their relationship continues to grow. For more information about Safa Jewelers' products and services, please call (732) 205-1350 or visit our website.